It's approaching the end of May and we should have been getting plenty of practice chukkas in on the grass this month but unfortunately the weather has delayed all polo in Ireland. Our first tournament was due to be played in Wicklow on 19th and 20th of this month but it was cancelled and we played chukkas in the all-weather arena at Polo Wicklow instead. It’s fantastic to have an arena to play in but the demands of arena polo are somewhat different to grass polo. The smaller space of the arena requires a lot more stopping and turning, whereas on the grass there are more opportunities to get to a full gallop after the ball. Not all ponies are suited to arena polo and visa versa. LHK Polo use the arena chukkas over the winter period to progress young horses as it gets them used to the hussle and bussle of polo in a confined space but now all the playing ponies are eager to get out and back to doing what they do best, playing on grass. We wait all year for grass polo in what is a relatively short season from end of May to start of September so fingers crossed the weather improves from now on and we will see you all soon for some Polo! Fed on Bluegrass Re-Leve for ulcers and hind gut acidosis. 15.2hh Argentine chestnut mare owned since 2009. Won Best Playing Pony at Pink Polo in the Park 2015. 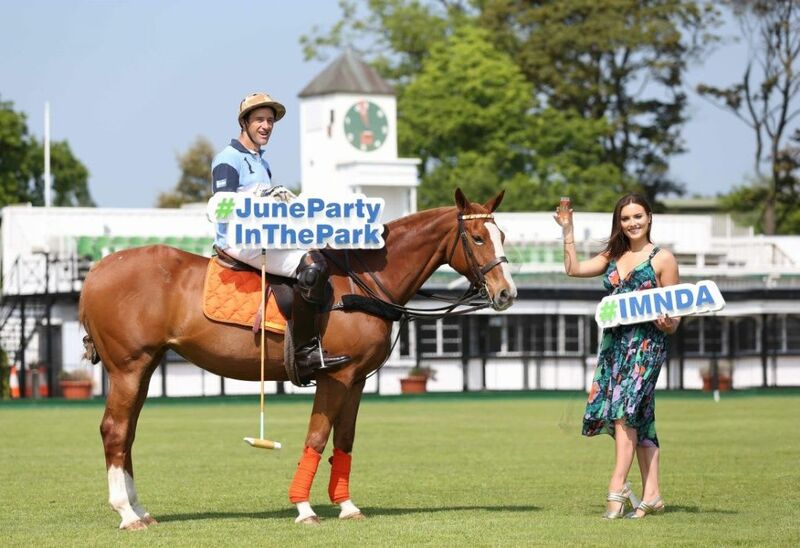 Modelled for the June Party in the Park 2017. Violet was bred in Argentina for polo. We got her from England where she had been playing a little and she has continued to play here in Ireland with us ever since. She is a very strong, agile horse with amazing turns and a great sprint, although she likes to spook at the polo boards on occasion! Violet is also a perfect pony to learn polo on as she is very easy to ride and keeps a lovely rhythm for hitting the ball. In July 2016 Violet even helped out with the Free Spirit Equestrian Bessbrook Pony Camp giving all the kids a ride and a chance to try hitting the ball – she was definitely the star of the show. 15hh chestnut mare owned since 2017. Bred from polo playing parents. Lizzie is a baby and she just has this year’s arena season behind her so will be starting out on grass for the first time in the next few weeks. We had a lot of fun with Lizzie this winter as she liked to buck or rear when you hit the ball but playing in the arena and plenty of practice with the stick and she is now much better. She has a very good stop and has no fear so is strong in the ride offs too. Hopefully this will be an up and coming one to watch for LHK Polo in the future. Lizzie is also our water baby absolutely loving to go for swims at the beach and even putting her whole head under. Catch up with us next month, hopefully we will have some good weather and a chance to get out and play on the grass! !